The water utility is part of the Utility Division and is responsible for the production and safety of the water supply as well as reading all the meters on a quarterly rotating basis. It also provides all of the testing on the water distribution system. Two operators are employed in water utility operations on a full-time basis. Four employees of the Department of Public Works maintain state certifications related to water systems. Water is valuable. Please do not waste it. A dripping faucet or fixture can waste 3 gallons a day…a total of 1095 gallons a year. Water Hydrant Flushing. While the City provides safe and clean water to its consumers, it is necessary to occasionally flush the water lines out. By doing so, any sediment or stagnant water is expelled through the flushing process. The City flushes the hydrants twice per year; generally the last full week of April and the last full week of September. Watch the local newspapers and the cable access channel for specific dates as they may change due to weather conditions. The flushing operation may cause discoloration of the water. This is normal. The flushing operation will continue until the mains are clear, which may take a few days. We recommend that if at all possible, residents refrain from washing white clothes until the water is again clear. If your industry is affected by the water flushing, please notify the DPW at 543-8858 so that we can notify you of the flushing process in advance. Water Hydrant Rental. The City has a program by which contractors can purchase bulk water from the City. A deposit is required for the meter. Please fill out the Fire Hydrant Permit for Temporary Water Service form and bring the permit to the DPW offices at City Hall for processing. If you have any questions, contact the DPW at 543-8858. Cross Connections. In an effort to protect the potable water supply, the City has enacted a cross connection ordinance. Backflow preventers must be tested by a licensed plumber on an annual basis. A copy of that report must be filed at the DPW office. If you have questions regarding the ordinance, please contact the DPW at 543-8858. Wellhead Protection. 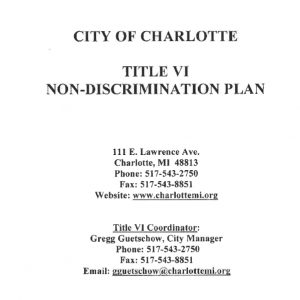 The City of Charlotte originally prepared a Wellhead Protection Plan in 2000. The plan was recently updated, and has become more comprehensive. For more information, click here. 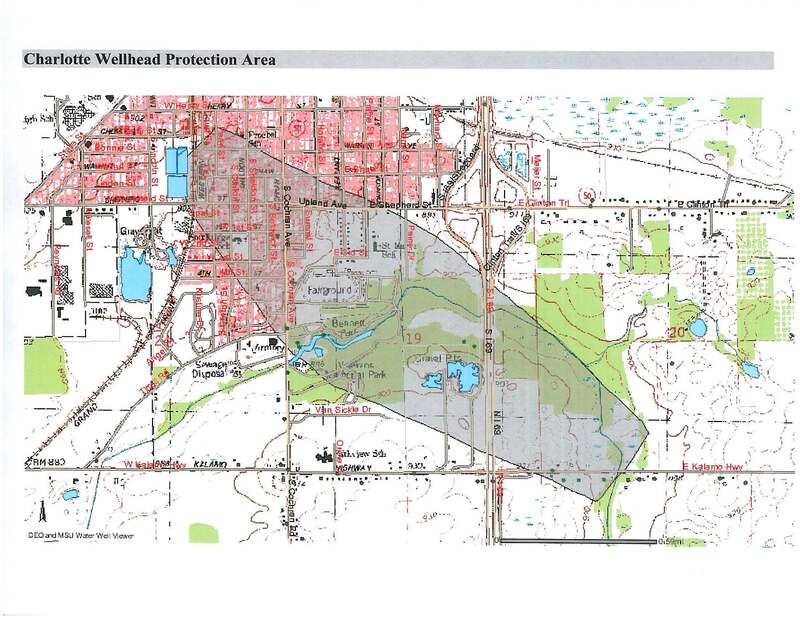 The Wellhead Protection Team meets quarterly to discuss issues relevant to the protection of our drinking water. The group is made up of individuals from the City and other governmental agencies who share this common interest. Educational activities are carried out by the Team with assistance from the Michigan Department of Environmental Quality’s Wellhead Protection grant.